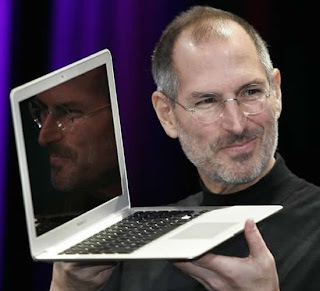 When Steve Jobs presented the Apple Macbook series to the world, I fell in love with the Apple notebook series too. I presently use an outdated IBM thinkpad for my personal use.All my blogs are typed, edited and posted from my IBM laptop. My short term plan was to own an Apple Macbook and Blog using it. But when I came across the price-tag of an Apple computer,it gave me a shiver down my spine that ended up as a silent fart. In order to buy my own Apple laptop, I started saving money. But I could not save enough money in a short span of time. Hence I decided to earn through my blog. But again that did not give me enough returns. So I started the Red-Chaddi campaign. More public display of red underwears would result in me getting more money from the DCSW (Dubakoor Council for Social Welfare).The campaign was one of its kind because it gave a great vision to the google-generation youngsters.Soon many youngsters started wearing red underwears over their trousers and made a strong fashion statement to the entire world.A friend of mine, Anu also wanted to join this campaign and she asked me to take a picture of her in the red underwear. She was very angry with me because she wanted her face to appear in the photo. I told her that it would not make much of a difference; be it her face or her back. She is not picking up my calls for the past one week . Is she angry with me? I don't know. How ever the American Government could not tolerate the growing popularity of the Red-Chaddi movement across the world. So, in order to curb the red-chaddi movement, Bush introduced the Black-Chaddi movement. In the below picture, Bush is seen promoting the Black Chaddi movement. When, even the powerful Oil rich countries could not stand Tall against the Bush Force, how could one expect the small Chronicwriter to fight such a competition? Thus red-chaddi movement came to an end. When the red-chaddi movement came to an end, I even thought that I could never own an Apple laptop. As a last ditch effort, I made up my mind to sell one of my Red underwears. So I tried selling my red underwear on e-Bay and Boy-O-Boy,the girls were just crazy to bid for my red underwear. Click the picture to get a better view of the bid process. haha.. whoa!! Great idea!!! I'm going to do tht to my desktop and use duct tape to stick the key board to it and then the apple too.. Awesome!! lol, the new Apple Notebook is awesome!!!! wow, congrats on our new laptop, looks awesome. does it have all the latest features??? 8 months and 7 posts, great going chriz....(Red chaddi - ur first post was in Sep'08)... by the way ani wants a PS3... edhu madiri edavadu shortcut irukka sollunga???? good one :) loved it. LOL! Well I loved your new apple macbook! HHAHAHAHA!! This is genuinely d best entry ever! can u pls pass me on ur laptop.......i want it now, never saw such a fantastic piece!!!!!!!!!!!!!! You upgraded your IBM into Mac in a so inexpensive manner. BTW, there is another advantage now for your laptop, you are also protected from the harmful viruses and even dont need an antivirus too, the apple does the trick!! "An apple a day keeps the doctor away". I am sure there some potential buyer on this blog ...... lol !!! This mac is made in kashmir. you should have thought about the upgrading thing before itself! By the way, what was bush doing with black chaddi with him? that screenshot! 10000$, sure things are becoming costly! Hehehehee... :D very smart !! LoL....jus now i was analyzing the Blue ocean strategy.....!!! Jobs got a tough competition here to market his product....!!!! Hope you should ve followed any of those techniques,to market ur "RC". Dont worry if u ve any idea of marketing "IBM-MAC"...(caption: An intelligent appetizer)jus ping me!!! At last ur RC (red chaddi)gave RC (Royal Challenge)to ur friends!!!! U are justed obsessed wid ur undies aint it? Wonder if u had something to do with the pink chaddi campaign also...U must have got the whole lot from Muthalik at concessional rates, rite? """shiver down my spine that ended up as a silent fart"""
lolz !!! Jus sell another red jaddi :P nd this time keep the amount secret !!! the mac book is def great!! Side la apple la kadichu vacha it will be apt...but still it luks gud...resale value must have gone up drastically!! steve jobs needs to be mailed abt it.. I'd make sure..tat u don't get Apple Mac huh! my friends think Ive gone cuckoo..
godly upgradation of your lappy!! LMAO!!! Can I have that apple please? your red underwear was on sale? n no one told me! we must all draw inspiration from you. thank you. Lol! !that upgrading ur IBM laptop to Apple macbook... was some idea!! that was some revolution. i must say bush would have some jitters. and yes, i like the apple, but not the tape. seppu chadi sangam (SCS) valarga! LOL. that was an unique mac that u've upgraded...u should have thought about it before itself..and what is bush doing with that black-chaddi? sorry for being a pest;). Few more additions to that list (based on another friend's request). Check it out if you have time and are interested. thats the most innovative way i've ever come across to upgrade from IBN to Apple!! :D i'll keep it in mind in case i ever need it! now here is something to turn you green... im going to use a apple mac comp in coll and u will still be using IBM.. not that i find you lappy outdated.. having a lappy to blog must be a bliss...how i wish for one too..
haha that was bloody brilliant, now y did nt i thnk of upgradin my old dell that way. omg ur still obsessed with wedge-creating red undies!!!!! You are a mess! Thanks for making me laugh!! ha ha !! u r too much !